Design Hovie Studios have set up Facebook and Twitter pages for Watson's Harverene Resort. Watson's is located on the South Shore of Lake Chelan, a pristine glacier fed lake in central Washington state. 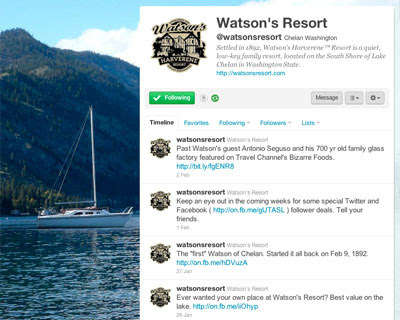 Follow Watson's and get the inside scoop on one of the hottest vacation destinations in the Northwest.